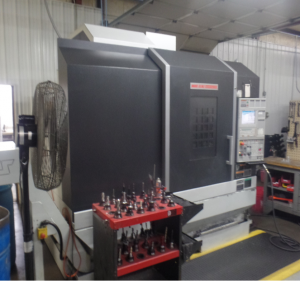 Vertical Mills | Wichita KS Machine Shop | Integrated Components, Inc.
Milling machines are an invaluable part of the machine manufacturing industry and carry out one of the most common machining procedures in workpiece production. Milling is a metal cutting procedure that utilizes a carving and removal process to create parts such as gears and ball bearings. Vertical mills have a spindle that moves vertically up and down over the workpiece surface. Relying on a series of specially shaped rotary cutters, milling machines can shape edges (round or square for example) and drill or bore into piecework to create highly detailed designs. 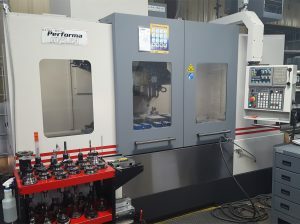 The Mori Seiki 5100 is a high performance milling machine that provides both reliability and cost efficient production. It offers three X-axis stroke variations: 600 mm (23.6 in. ), 800 mm (31.5 in.) and 1,050 mm (41.3 in.) to adapt to our customer’s diverse machining requirements. Integrated Components primarily uses this mill for hog outs – the high-speed removal of material in larger quantities. Hog outs are preferred (as opposed to casting) for prototype pieces or when only a few pieces are required. Our Akira Seiki HV5.5A is a powerful milling machine used primarily for piecework that requires removal of a lot of material. At Integrated Components, we use this mostly for hog outs. The Sharp series of vertical milling machines are engineered to produce unsurpassed quality work. 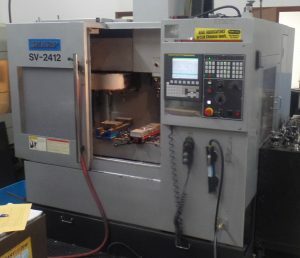 Integrated Components is proud to include this model among our vertical milling machines. With a proven track record, they outperform all other milling machines in this category, with high speed detailing and design.